TWO TIMES TWO MANY (Herb Rungay): Three red cards and three black cards, but an extra black card continuously appears. Then you remove a black card and a red one and finally, you have six cards: Three red and three black! BLACK SANDWHICH RED SANDWHICH (Mark Leveridge): A card is placed between two Jacks, disappears and reappears between the other two Jacks! I OWE YOU 50C! (Ken de Courcy): A dollar (or any bill) is torn in half and restored in the hands of a spectator! QUARTET (Aldo Colombini): You and a spectator reveal four matching pairs of cards! JUMPING JOKER SURPRISE (Jomaguy): A selected card is replaced. Four blank cards are shown, they appear to be all Jokers. One changes into the selected card and the others cards are again all blank! THE CLEVER CARD (Ian Land): You show three blank cards, one of the cards is magically printed with a duplicate of a previously selected card! MIGRATING ACES (David Davis): A very easy and clever four Ace assembly with a regular deck of cards! IMPROMPTU GOOF BALL (Harry Carnegie): A routine with a 'sucker' ending for parlor or stage. A white ball changes color to red inside a paper bag. When everyone thinks they know how it is done, the ball changes to green! 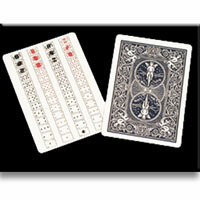 BACK ORDERED (Max Maven): Four cards appear to change into four double-backed cards one at a time. The cards are seen to have backs on both sides. Then again, they change into four regular cards! Simply enter your details below and we will send you an e-mail when “Magigram Vol.12 by Wild-Colombini Magic - DVD” is available to ship!